Bishop Karen Oliveto meets with her accusers prior to the Judicial Council hearing that will rule her election illegal. In the end, it was--and will continue to be, to the bitter end of the due process--as Methodist a defrocking as could ever be. It was inevitable from the moment Karen Oliveto was elected to the United Methodist episcopacy by the Western Jurisdiction that the legitimacy of that election would be appeal to the Judicial Council, the denomination's highest court. The Council's duties parallel those of the US Supreme Court: it is the ultimate arbiter in disputes over the Discipline, a copious and often self-contradictory book of rules and regulations that is, to some Methodists, more significant than the Bible. The Discipline can only be amended by the General Conference, a representative body of the entire global denomination that is equal parts clergy and laity, and which meets quadrennially. If the General Conference met more often, perhaps the Judicial Council would have less to do, as more time could be spent perfecting the often clumsily worded compromises that go into the Discipline. But considering how acrimonious those sessions have become, had they been more frequent, the United Methodist Church would most likely have ceased to exist years ago. There have been many issues dividing American Methodists since 1784, when Francis Asbury and Thomas Coke--commissioned by Methodist founder John Wesley to be "general superintendents" for the growing colonial branch of his movement--declared themselves bishops and initiated the first schism, as anti-episcopal "Republican Methodists" chose to break away; another sect, "Methodist Protestants," broke away in the 1800s over the same issue. A far greater rift came in the next century over slavery, and lasted nearly a century, time enough for the theology of northern and southern Methodists to grow apart from each other in a multitude of other ways. Still, the two denominations felt they had more in common, and that the end of slavery had rendered the grounds for schism moot, so with ecumenism in the air, they reunited in 1939 to become simply the Methodist Church. A 1968 merger with the Evangelical United Brethren created the United Methodist Church--and almost immediately launched the infighting between evangelicals and progressives that has grown over the decades from hairline cracks to a grand canyon that will almost certainly lead to the division of the denomination along theopolitical lines. The Discipline has been the stage for most of these battles, and the most bitterly, continuously fought of them has been how the church shall address the existence within its membership of homosexuals. The issue was first enshrined at the very first General Conference of the fully merged denomination, as in 1972 the words "homosexuality is incompatible with Christian teaching" were voted into the Discipline. This gave rise to the "Reconciling Congregation" movement, a phenomenon with parallels throughout mainline Protestantism: churches that functioned much as sanctuary cities do with respect to immigration, refusing to draw distinctions between members along lines of sexual orientation. I was blessed to be pastor of such a church from 1992-95. The movement has grown over the years, especially in the more progressive Western and Northeastern Jurisdictions, but also, significantly, in large cities throughout the Southeastern and South Central Jurisdictions, as well. There have been many watershed moments in the struggle between the forces for greater inclusion and those who cling to the belief that any deviation from monogamous heterosexuality is a sinful perversion: the commission of study committees, listening sessions, denominational conversations, protests, demonstrations, the constant wack-a-mole of LGBTQ advocates figuring out work-arounds to the Discipline, only to have loopholes closed in the very next General Conference. Over time, a de facto approach developed for administrators who chose to simply look (and listen) the other way so as to never officially know they were ordaining gay and lesbian pastors, and presiding over pastors, both gay and straight, who were performing same-gender marriages ceremonies. These Bishops and superintendents were often guests in the homes and churches of gay pastors, may even have attended some of the weddings, but as long as certain words were not spoken in their presence, could continue to pretend no one was violating the Discipline. Only if charges were filed would any action be taken--as happened from time to time. The frequency of church trials has grown in recent years, even in the most progressive of Annual Conferences, as conservatives have become furious with what they rightly see as a flouting of church law. What's been missing all these years has been a church administrator willing to face church sanction over the issue. Increasingly, pastors have put themselves on the line, risking their own livelihoods to bless the unions of gay and lesbian couples; but until now, no superintendent or Bishop has taken the plunge of publicly disobeying the Discipline. I would like to think that ended Friday. But I'm not hopeful. Last July, Karen Oliveto, a pastor living in a legal marriage to another woman who fits the Discipline's definition of being a "self-avowed and practicing homosexual" as well as any I've ever met, was elected Bishop by the Western Jurisdiction, and assigned to an episcopal area that includes the Rocky Mountain and Yellowstone Annual Conferences. 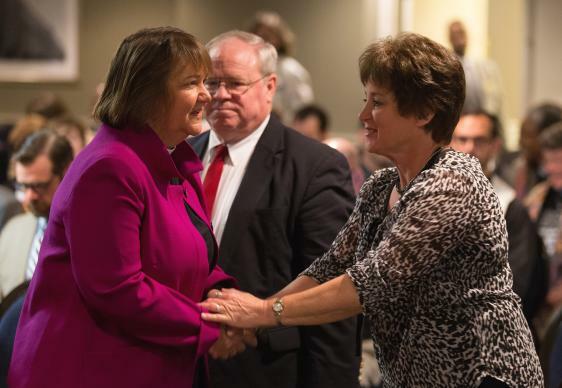 Bishop Oliveto continued to be open about her relationship status and orientation, giving United Methodists opposed to her presence in the ministry, let alone the episcopacy, ample ammunition to mount a campaign against her. Complaints were filed, and charges are pending, but potentially the greatest blow came Friday, when the Judicial Council ruled her election a violation of the Discipline. To the Council's credit, they really could do nothing else. It's not their job to change the words of the Discipline. 45 years of wack-a-mole have rendered those words as clear as they can possibly be. The only way for a non-heterosexual to be ordained in the United Methodist Church is in violation of the Discipline; therefore, it is illegal for Karen Oliveto to be an ordained Methodist minister, and as only ordained ministers are eligible to be elected Bishop, for that election to have occurred. Also to their credit, the Council was clear that its decision did not nullify the election, or alter her status as a Bishop. It is up to the Jurisdiction that elected her to, through due process, resolve the complaints that have been registered against her. Should those trials acquit her--or, far more likely, given the way they usually end, discover some technicality that permits them not to render a decision one way or the other--she will remain a Bishop. But here's the thing: there is no getting around what happened Friday. The Judicial Council of the United Methodist Church has ruled that it is illegal for a self-avowed, practicing homosexual to be a Bishop. What's more, the Council directed all Boards of Ordained Ministry--the regional bodies that screen candidates for ministry--to consistently apply the orientation criterion in their deliberations. Many of these boards have engaged in a sanctuary-city-like practice, adopting policies of refusing to use the rule as part of their decision-making. From now on, these boards will, themselves, be subject to church discipline should they continue to ignore the language. Which is why I believe April 28, 2017, will from now on be remembers as Schism Day. I can't guarantee that. It's very possible that the Western Jurisdiction will comply with the Judicial Council and subject Bishop Oliveto to the defrocking of a thousand cuts that is the church trial process. The world is watching, and any efforts to deflect or ignore properly filed complaints will be seized upon by the ironically named Good News caucus, and used to file even greater charges against any and all church administrators not in compliance with the literal mandate of the Council. Bishop Grant Hagiya, responsible for dealing with complaints against Bishop Oliveto, has announced that due process will be taken with all of them. He and his assistants are very likely poring over the Discipline in search of any remaining loophole or work-around, as are chairs of every Board of Ordained Ministry that has intentionally ignored the sexual orientation of pastoral candidates. But it can't last. Bishop Oliveto's open defiance of these norms is far more than one woman standing up for what's right. It's a call to action. For 45 years, the church has been harming its own, driving many away, forcing those who remain to hide their essential natures, to parse every word they say in public, to pretend their life partners are roommates or friends, to live double lives, to deny their calls to ministry or, if managing to thread the gauntlet and be ordained, to live a lie in the presence of any church officer or administrator who, upon hearing certain words, would be required to act on them and initiate proceedings against them. Such treatment isn't just an injustice. It's an abomination. The Council of Bishops has been working, since last year, to arrive at a way for United Methodism to contain both those who believe non-normative sexual orientation should be affirmed, rather than condemned; and those who believe only monogamous straight persons have any place in the life and leadership of the church. I've believed for years now that this is a futile effort. There is a way, and it's existed for 45 years: don't ask, don't tell, but if you do find out, prosecute the hell out of whatever poor individual had the misfortune to hold hands with his partner at the city park long enough for some pious bigot to see it. There is nothing even remotely Christian about that approach, but as much as Bishops may appeal to the better natures of their flocks, there is simply no other way to keep both sides of the issue under the United Methodist umbrella. The time is at hand for us to go our separate ways; and as much as it pains me to say it with respect to all those sincere Methodists who just can't get past sexual orientation that's different from their own: good riddance.